I mean seriously!!! How adorable is this picture of Bugsy?!?! He’s waiting for you to take him home for the holidays!!! 2 Comments on "Take Me Home For Christmas – Bugsy"
I am looking for a male pug puppy for my daughter who is in college. Would love some help finding one. It’s not often that our pug rescue group receives puppies, but we do occasionally. We are more likely to receive adults and seniors. Our new intakes can usually be seen on our Facebook page before they are posted here on our website. 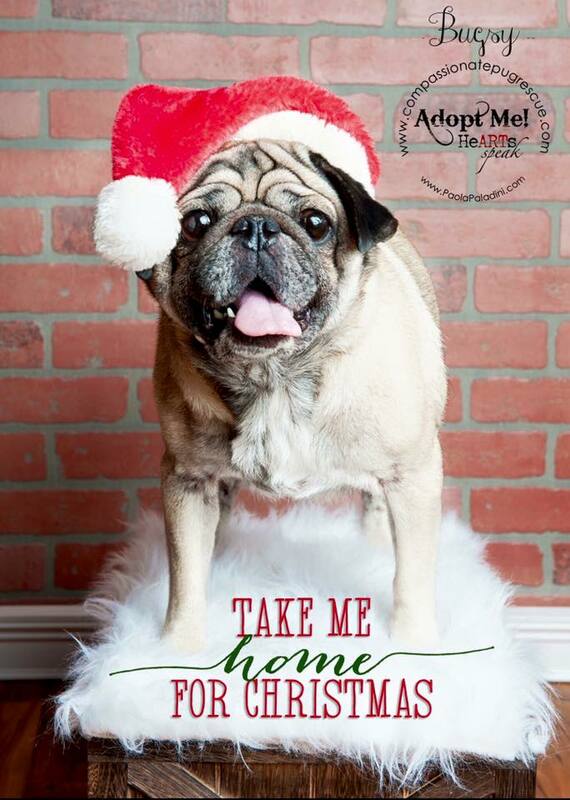 Please take a look at our website and if there are any pugs that you might be interested in there, AND if you are a Florida resident, age 21 and over, please come back to the website to fill out an adoption application. We look forward to hearing from you soon! Best of luck to you and your daughter!